Artistry on a racetrack. 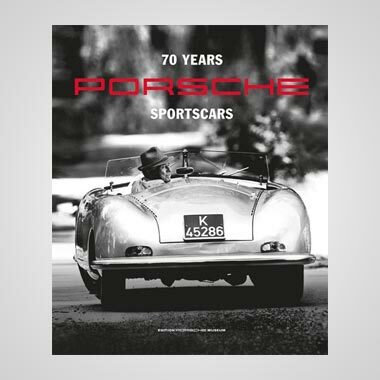 Traditionally it’s associated with such as Juan Manuel Fangio (the Nürburgring 1957, perhaps), Stirling Moss (Monaco 1961), Jim Clark (Monza 1967) or Ronnie Peterson (any time he negotiated the original Woodcote), but the concept has a more literal aspect. It’s sometimes easy to forget, in an age when drivers’ personal trademarks lie buried beneath corporate logos, but crash helmets were once every bit as individual as the human within. Remember Innes Ireland’s chequered strip? Jackie Stewart’s similarly straightforward tartan? Those white-and-orange bands with a large JODY stamped below? 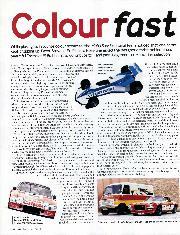 The simple colour schemes that defined Hulme, Amon or Cevert, easily sketched on a school exercise book? Ayrton Senna’s dominant yellow? Nowadays Formula 1 drivers are wont to make wholesale design changes from season to season, to tie in with team liveries, and the results are in any case harder to define from trackside thanks to steeply raked cockpit sides. Can anybody out there provide detailed descriptions of what Max Verstappen or Esteban Ocon wore in 2017, other than that one was mostly orange, the other pink – and that both differed significantly from what either had used the previous season? 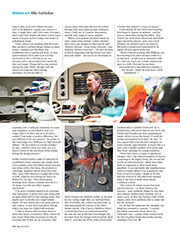 Raised in Nottingham, and armed with a graphic design degree from Trent Polytechnic, Mike Fairholme has been creating and painting helmet designs since simpler times, adapted to the corporate invasion and continues his craft to this day, though he’s no longer as involved in F1 as once he was. “I’ve loved cars since I was young,” he says, “though I was always a bit frustrated that Dinky Toys didn’t look quite like the models they were supposed to represent. I used to wonder how they could be improved. I guess it was an early sign of attention to detail – wanting to make sure things looked correct. 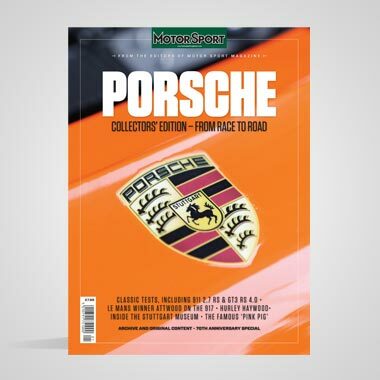 “I was taken to an Oulton Park clubbie in 1967 and then to the ’68 Gold Cup – three works Ferraris, Jackie Stewart’s Matra, Pedro Rodríguez in a BRM, two Gold Leaf Lotus 49s… That kind of left its mark on me, plus the fact I could stand in the middle of it all, with no fences around the cars. 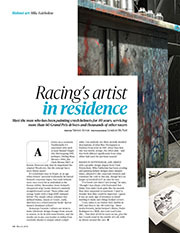 He describes his next few years as those of a “self-employed jobbing graphic designer”, supplementing his work for bike racers by producing posters and artwork for assorted clients. 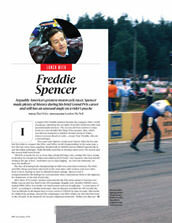 And then, in 1984, he travelled to Donington Park to deliver a helmet to British rider Niall Mackenzie. 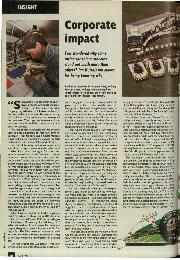 “That’s where I met Ferry Brouwer, who had founded Arai Europe in Holland. He was tasked with developing and promoting the brand in Europe. 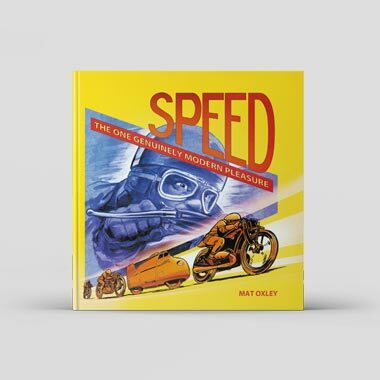 He had a racing background – as a former bike mechanic he’d worked with Jarno Saarinen and Phil Read – and wanted to talk to me. Back then the process was rigorously manual. “I’d cut masking tape to recreate any sponsors’ logos and paint pretty much all of them by hand. It’s hard to quantify how long it takes to do each helmet because they’re all different. I apply one colour at a time, a single layer, add a few coats of lacquer, flat it back, then finish with three or four more layers of lacquer before doing a few hours of polishing by hand. Some clients have come to him with established colour schemes that simply need to be painted, some with blank sheets of paper and others with a few ideas. He produces a charming, simplistic sketch from one of his files. 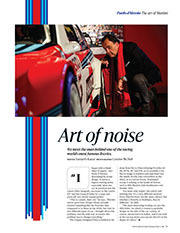 “Juan Pablo Montoya brought this to me in 1996, when he was driving for Fortec in British F3,” he says. “Two-dimensional drawings don’t always translate directly to a 3D shape, but this one didn’t require much work. “I’ve never troubled myself to do drawings that look pretty. A driver will come along with an open mind and I’ll start making notes, then maybe start to doodle on a rough helmet shape. I’ll then sketch out a few more and am into a three- or four-hour marathon, during which you hope for a light-bulb moment. “I chat to drivers and introduce them to ideas they hadn’t considered. What colours do they want? What kind of person are they in everyday life? If they are an extrovert, they can get away with some fluorescent yellow because they don’t mind people looking at them. If they are of a quieter disposition, metallic blue might be more suitable. 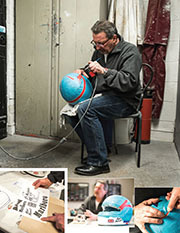 It was during the late 1970s that branding first began to appear on helmets – and the process intensified during the 1980s. 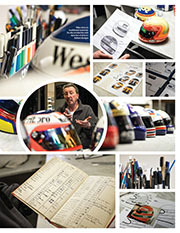 “Ron Dennis was meticulous about how and where logos should be placed – and, once you’d finished, the helmets had to be taken to McLaren’s commercial department to be signed off and approved for use. Fairholme’s career took off at a fruitful time, with more than 30 cars in F1, full F3000 and F3 grids and Arai committing to supply drivers across the board. 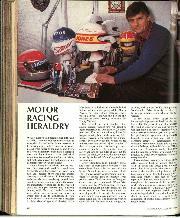 “I loved the racing environment back then,” he says. “It was a good time to be involved and gave me some fantastic opportunities. It wasn’t like it is now, with a smaller number of F1 teams and thus fewer openings for young wannabes. “There have been a couple of significant changes. One is the reduced number of drivers competing at the higher levels, the second the arrival of carbon helmets – which were three times as expensive as those made from glassfibre. It was inevitable that manufacturers could no longer afford to be as generous and Arai cut back its supply. 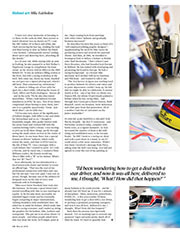 I began to do less and less work in F1 and effectively stepped away at the end of 2008, when David Coulthard retired. For all that the landscape has changed, one thing has remained a constant. “I remain incredibly passionate about what I do,” Fairholme says – a point rather reinforced by the line of primer husks that nestles nearby, awaiting a first coat.